Part of my job (a huge part) is to make the library a safe and welcoming place for all people. And I want the kids and teens at my library to know that I value them for whoever they are. 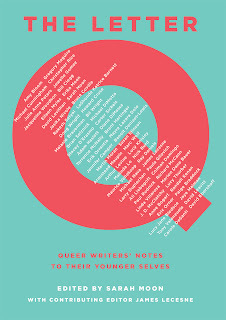 It is essential that we have books like The Letter Q: Queer Writers' Notes to Their Younger Selves on our shelves. So, I'm very happy to announce that Scholastic is providing two copies of this book for me to give away! To enter, just fill out this form (once!). You must be at least 13 years old to enter. This giveaway is open to US residents only. I will not share your information with anyone (except the two winners - I will send your mailing info to Scholastic) and all information will be deleted after the giveaway is over. Two winners will be drawn at random on Thursday, June 7.